A Soyuz rocket boosted two validation platforms from French Guiana into orbit Friday for Europe's Galileo navigation network, setting the stage for further launches every six months over the next few years to build a constellation of satellites beaming global positioning services to airplanes, automobiles and millions of users. The identical 1,543-pound satellites blasted off at 1815 GMT (2:15 p.m. EDT) atop a 151-foot-tall Soyuz 2-1b launcher, climbing into a mostly clear sky over the Guiana Space Center, a European-run base on the French Guiana coast near the community of Sinnamary. The kerosene-fueled rocket soared on the power of 900,000 pounds of thrust, penetrating a thin layer of high-level clouds before jettisoning four strap-on boosters in the upper atmosphere. The three-stage rocket deployed a Fregat-MT upper stage and the twin Galileo payloads less than 10 minutes after liftoff. Two burns of the Fregat engine accurately placed the Galileo satellites in a circular orbit 14,400 miles above Earth with an inclination of about 55 degrees. The satellites were released around 2200 GMT (6 p.m. EDT), and controllers in Toulouse, France, acquired radio signals from the spacecraft moments later. The satellites were supposed to deploy solar panels soon after separation. "Today's success is a success for Europe," said Jean-Yves Le Gall, chairman and CEO of Arianespace, commercial operator of the Soyuz rocket. "Europe has decided to gain its own satellite navigation system, the Galileo constellation, and the economic and social advantages of this will serve all of our citizens." After adjusting their positions in orbit, the satellites will join two other Galileo spacecraft launched in October 2011. The quartet will begin a comprehensive test campaign this winter to prove the Galileo "mini-constellation" can provide navigation services. A control center in Oberpfaffenhofen, Germany, near Munich, will assume command of the Galileo satellites for normal operations. Fucino, Italy, is the hub for all Galileo navigation services. The first four Galileo satellites are part of system's in-orbit validation, or IOV, phase. The IOV program costs 2.3 billion euros, or about $3 billion, according to Sara Tironi, a spokesperson for the European Commission, the executive body of the European Union. Astrium GmbH of Germany is overseeing the Galileo IOV phase, while Thales Alenia Space of Italy assembled the satellites. Astrium Ltd. of the United Kingdom built the navigation payloads on-board each spacecraft. Four satellites are needed to generate a precise position fix on the ground. 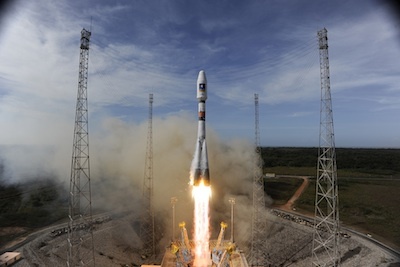 If the system works as designed, European officials will approve the launch of the next two Galileo satellites on a Soyuz rocket in April 2013, Tironi said. "I feel quite emotional, but it's really a very special day for me," said Didier Faivre, director of ESA's navigation programs, in post-launch remarks in French Guiana. "The first two IOV satellites are working very well, and we're very confident for the future ... We've got another 22 spacecraft to go up on five Soyuz launches and three Ariane launches." The commission manages the Galileo program on behalf of the EU, while ESA acts as prime contractor and procures satellites, launch services and other systems. "As of tomorrow, we'll be getting down to work," said Paul Flament, Galileo program manager at the European Commission. "Thanks to these [new satellites], it's going to be possible to validate the operation of the system, and then we will move on to the next phase, which will be to deploy the infrastructure." The launch in spring 2013 will loft the first two Galileo full operational capability, or FOC, satellites. OHB System AG is constructing 22 Galileo FOC satellites in Germany with payloads from Surrey Satellite Technology Ltd. of the UK. Launches for 14 of the FOC satellites are under contract to Arianespace, which plans to orbit the spacecraft two at a time on Soyuz rockets or four at a time on Ariane 5 rockets. The first 18 satellites, including the four craft now in space, should be in orbit by the end of 2014, allowing Galileo to begin initial navigation services. Galileo is Europe's counterpart to the U.S. Air Force's Global Positioning System. 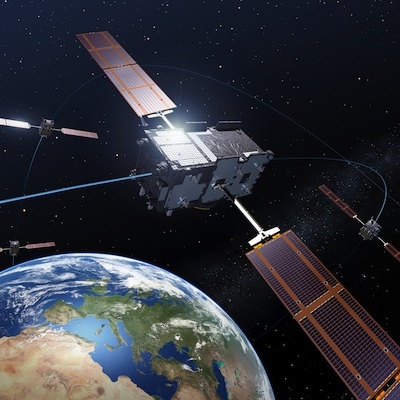 "There are not that many [navigation] service providers, and for the moment there is one working very well, and that is GPS from our American colleagues," said Paul Flament, Galileo program manager at the European Commission. "We are trying to do at least as good as they have done in the past." The Galileo satellites will be placed in three orbital planes. Eight satellites in each plane will constitute a full constellation, and Europe aims for a 30-satellite fleet including spares by 2019. "For the users, the more service providers, the more they can benefit from the presence of more satellites in the sky because then they can have better accuracy, better availability, and better continuity of service," Flament said. Russia's Glonass fleet and China's Beidou network also provide navigation services from space. "What is of utmost importance is not to compete with these other service providers, but to find the right way forward to make sure we don't pollute each other," Flament said. "In the end, the real benefit will be for the final user. It's important for Europe to get the technology, to master the technology, and to be present in that very important and strategic field. We don't think we're too late. On the contrary, we arrive at the right moment."